Affidavit and Declaration forms. Attorney prepared. Ready for immediate use. An Affidavit is a legal document that allows a person to make certain declarations under oath. Declarations are similar to affidavits in that they are taken under oath and are used in making truthful statements of certain facts in a legal matter. An Affidavit can be sometimes used in place of testimony in a court proceeding if a witness is unable to be present. General Affidavits - which can be used to verify information or for certain court proceedings. Real Estate Affidavits - which include declarations about title and appraisal of property. Name Affidavits - where you declare that you are the same person but known as a different name. Affidavit of Title Specialized type of affidavit is used in real estate transactions to verify certain information regarding a piece of property. Appraisal Affidavit Describes the specific aspects of a property appraisal. A financial institution will usually require this type of document at the closing of a real estate transaction. General Affidavits Document used by a person to make a sworn statement about certain facts. Name Affidavits Allows a person to state under oath that he/she is the same person as the other names listed in the affidavit. Name Declaration This is an affidavit form that allows a person to state under penalty of perjury or under oath that he/she is the same person as the other names listed in the affidavit. Affidavit Forms Combo Packages Get 5 forms for just $39.95. Save 53%! 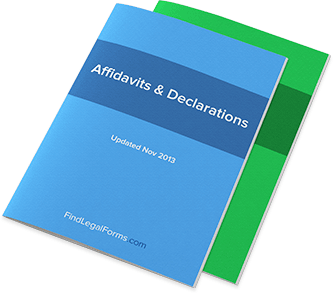 Save Money by getting our popular Affidavit forms together in one convenient packet. For a lot of people, the word “affidavit” doesn’t have a lot of meaning. They might have heard it on a legal TV show once, or they might have heard one of their lawyer friends mention it in passing. But the truth is there are a great deal of people out there who know exactly what an affidavit is without ever having graduated for law school, because an affidavit can be an important part of some of the most crucial events of our lives. How do you define an affidavit? Quite simply, an affidavit is a sworn statement of fact, almost like putting a witness testimony to a truth down on paper – though it’s important to note that the legal ramifications of each type of testimony can be quite different. An affidavit simply refers to “has declared upon oath,” which is the meaning of where the word came from in Medieval Latin. Using an affidavit for the first time can be a daunting thing – putting something onto paper that will be concrete as long as the paper exists. But stick to this guide and you’ll understand just how and when to use an affidavit for the first time and you’ll realize it’s not a major challenge at all. The truth is, you might have signed an affidavit before without having known.You knew you signed something and acknowledged it to be true under penalty of perjury, but you might not have realized that what you signed is technically an affidavit. These affidavits are often used in sign-ups and registrations that are important for government participation such as in voter registration – if you sign that you agree that the statements are true and they are not, then you could face charges for perjury according to the law. Affidavits will also be used in other events to gather witness testimony when a witness cannot be accessed – these are sometimes special circumstances and will often depend on the individual situation of a court or legal proceeding. If you haven’t dealt with affidavits before, remember that the actual process of signing one is simple: you read through the information that is spelled out (and which you’re verifying for the purposes of the affidavit) and decide whether or not you want to have said what is said there. Make sure all the information you enter is true and accurate to your best knowledge, and then feel free to sign it. After all, there is not a lot of legal harm that’s going to come to you simply because you’ve put the truth to paper. In some cases, you simply need to sign an affidavit as part of a larger form, as we saw in the voter registration example. If you’re confused still as to what constitutes an affidavit, be sure to search through FindLegalForms.com and find examples that you can use for reference. You’ll be glad you did. Although the name might sound like incomprehensible legalese, the function of an affidavit can actually be both simple and vitally important. That’s because an affidavit is essentially a sworn statement of fact that is signed upon - it is a document that verifies someone’s statement as to a fact’s authenticity. In other words, it is a declaration. In many cases, a signed affidavit can have wide-reaching effects on a particular case, because affidavits often carry the same power as declaring something under oath, with the penalty of perjury a potential option if the affidavit turns out to be forged or untrue. What role to affidavits have in our society? You’re about to learn about their potential uses in individual legal cases as well as the kind of ramifications they can have on your life if you’re the kind of person who knows how to use contracts to help you navigate this complicated legal system of ours. Let’s take a closer look at affidavits and find out what they’re all about. First, there are generally some parties involved in an affidavit that you’ll want to be aware of. The first is the affiant, generally the author of the statement who then signs it. The second is the witnessing party, often a notary public - someone that can officially notarize the document and ensure its authenticity. The various parts of an affidavit will then have a tremendous impact on any legal matters pertaining to the contents of the affidavit. For example, it is important to have a commencement in the affidavit - this is an identifying section that points out exactly who is signing the affidavit. It is also crucial that the statement of truth, a vital section, which is exactly what facts the affiant is verifying the authenticity of. Another section, the attestation, verifies the date and signing of the affidavit. When you add these parts together, you get a very concrete legal document that carries the weight of a legal oath - not telling the truth on an affidavit can be equivalent to perjury and will contain similar punishments and legal entanglements. Why do people sign affidavits? They can often do so at the behest of others, helping another party by essentially “taking the stand” in advance, on their own. Having someone else’s affidavit handy can lend a lot of legal weight to the complaints another person is making against another person, which can help certain lawsuits settle out of court, for example. Affidavits can carry a lot of legal weight before a suit is even brought to court, meaning they essentially are a way to use legal “witnesses” before their need should ever arise. In many cases, affidavits can be used to prevent lawsuits, or to make sure that someone bringing a suit against you does not have a very strong case. It’s important to understand the power an affidavit has and to respect the legal weight they carry - they certainly are not documents to throw around or sign without thinking.